This past weekend, our family drove down to southern Illinois to celebrate the 90th birthday of CapableDad’s grandmother. It was a special weekend because most of his family members were able to get together, including relatives who flew in from California. Grandma lives in a small town of about 2,000 people where she and her husband lived their entire lives. When we drove into town, we were struck by what we saw on the town square. 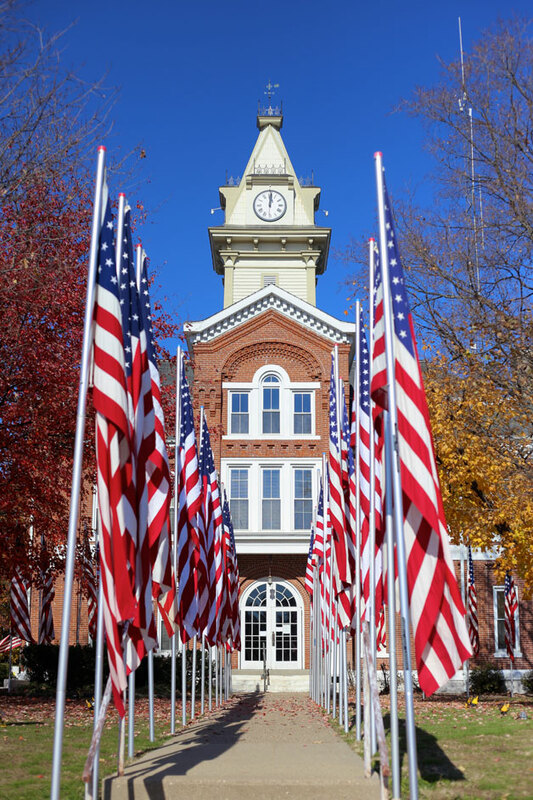 American flags had been erected on flagpoles in every direction, lining the sidewalks surrounding the courthouse. It was so unexpected and inspiring that it took our breathe when we rounded the corner and saw all of those flags waving in the wind. 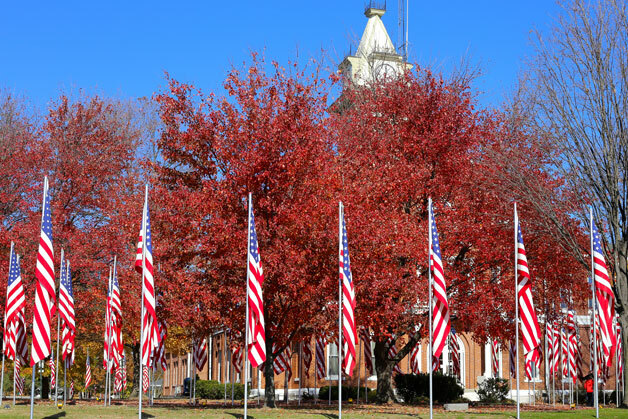 We found out that the town puts up a flag for every veteran from the county who has died. 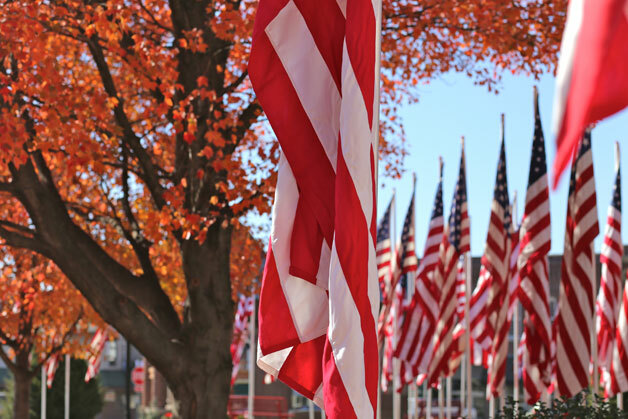 The display has taken on a life of its own, growing each year as more families put up flags in honor of a veteran. 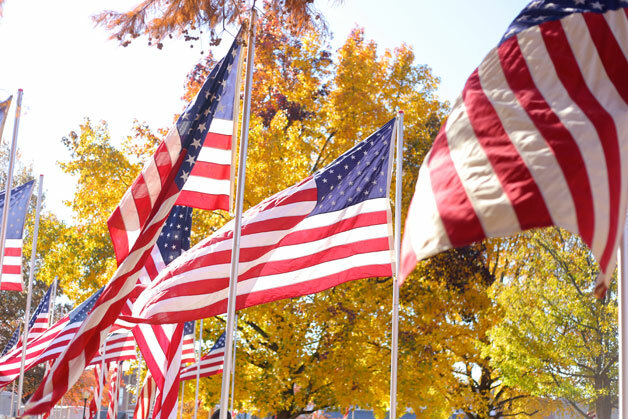 Somewhere among all of those flags was one flag that had special significance for our family. My husband’s grandfather had one brother. The two of them grew up in this tiny town, helping their father on the farm. The older brother served in World War II and then later moved to California where he got married and had kids. Despite the distance, these two brothers were best of friends. They looked alike. They both had a dry sense of humor. And when the elder brother died a few years ago, grandpa must have decided it was time for him to go to heaven, as well. He died just a few months later. Our great aunt (the wife of grandpa’s brother) was able to travel to Illinois, along with two of her daughters, for grandma’s birthday. 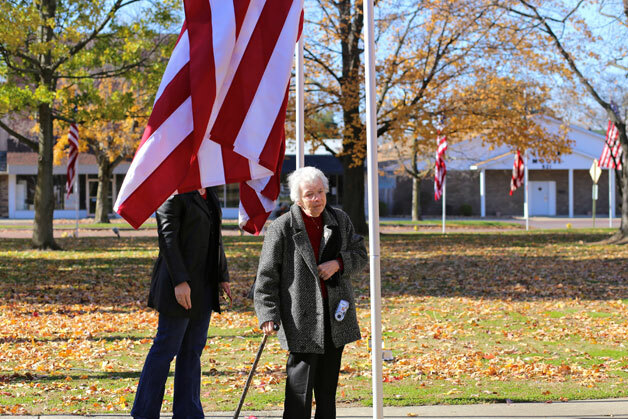 On Sunday, we met at the town square to find her husband’s flag. We walked from flagpole to flagpole, searching for his name. Up and down rows of flags, we read the names of people who had served our country. It was incredible to think of each of these men and women who had fought for our freedom. Even with five adults and our four children searching, it started to feel like we would never find his name. Then, his daughter waved to us from a section of flags in back of the building. We all rushed toward his flag, anxious to find the object of our search. So many flags flowing all around us, but this one mattered most to us. As we walked around the building, it almost felt like we might find someONE, rather than someTHING. We were wishing for a moment with a special loved one. Longing for more than a name on a pole. But thankful for something to gather around to remember. Previous Post Previous post: Bursting. This is stunning… Powerful… Gorgeous… Moving… Beautiful!!! Thanks, Sues! I haven’t been to that place in Naperville! I will have to check it out. Beautiful photos! I’m glad you found your flag! Thank you so very much, Emily, for this beautiful and touching post about Daddy! I’m crying as I write this! I’m so grateful that we were able to be back there this past weekend, not only to celebrate Aunt Vera’s 90th birthday but to also remember Daddy’s life as well. 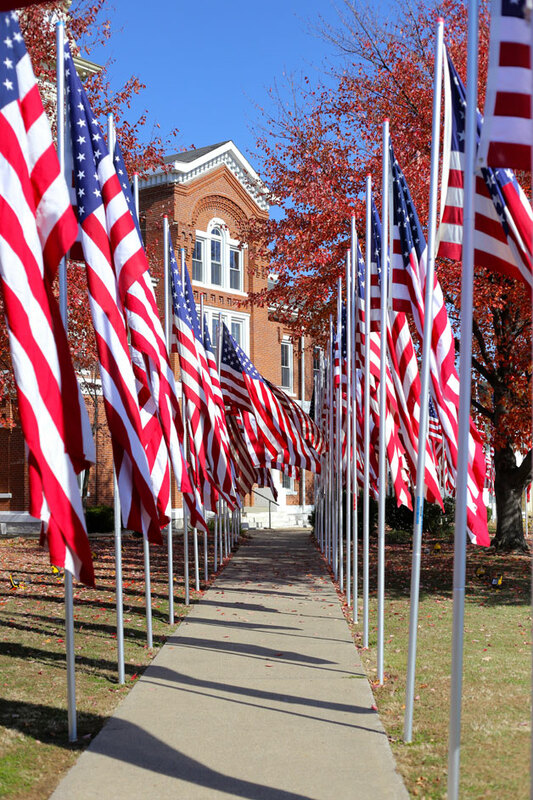 When we first saw the flags, I didn’t even think about the fact that one would represent someone we knew. It was a special moment finding your dad’s flag. We’re glad we were part of it!